Simple question, I think, does anyone know who actually manufactured the SIG 522 pistols/rifles? I don't think it was Umarex, was it actually SIG?? I have one, and I'm pretty sure it was made by Sig. They're great guns. I haven't found any ammo they don't like, which is rare for rimfire autoloaders. Great with a supressor, too. Only asking because I just acquired this heavy barrel and I was curious regarding its provenance. heavy barrel was an optional accessory. I had a 522 with original threaded barrel and the accessory HB and it was a great gun. I have the same gun, second one actually as I stupidly sold the first one. I had the heavy barrel cut to 16.25” and threaded. Great suppressor host. Not ammo sensitive at all. Trigger is heavy on it. And yes, these were made by Sig and for the money probably the most robust .22 replica of a centerfire rifle out there. If you ever needed to use it as a club I wouldn’t hesitate. The down side is that being so heavy makes it tough for a younger shooter to hold. Still a very very well made rifle that mostly flew under the radar. I believe they were at least assembled by Sig in NH, and maybe even produced there. Great little rifles, accurate and reliable. I always wanted to try one but never got around to it. For a time there was a pistol version that would have been superb with today’s brace options. I still have that exact package with the HB still in the original packaging. I have a 522 with the folding stock and had no idea they were discontinued. It is an excellent rimfire rifle, extremely reliable shooter. It has literally never failed to fire in the over 2000 rounds I have put through it. I like the Black Dog Machine mags. I haven't shot it in a couple of years. I think I'll pull it out next time. just don't break it as with all things sig discontinued its past its parts due date. Another plus is that the mags are the same as those used in the CMMG type AR .22 conversion kits. So did the Mosquito that was produced by GSG. Until I read this post I didn't realize the 522 had been discontinued. I purchase mine in 2011 and has always run without any problems. So we are screwed if we need parts? Yes, as with many things Sig. I bought the pistol version some years back, for a while they were offering them with a green laser for $499 but there was a dealer or maybe a distrbutor that was selling the pistol & laser seperate ... IIRC the pistol was $299 I got one to SBR, sold the swat handguard a year or so later on GunBroker, it was enough to cover the stock & plastic handguard ... I really should have taken an updated picture, for a while it and my P556 SBR were almost identical. I had a 16" for a while too but sold it to a buddy. That's kind of the reason the question was in the back of my mind, when I posed the question. The main difference I see in the 522 is that it seems to be far simpler, more robust in design and materials than the pot metal used in a lot of those types of designs. Certainly the choice of magazines (Black Dog) was much better than some/most. 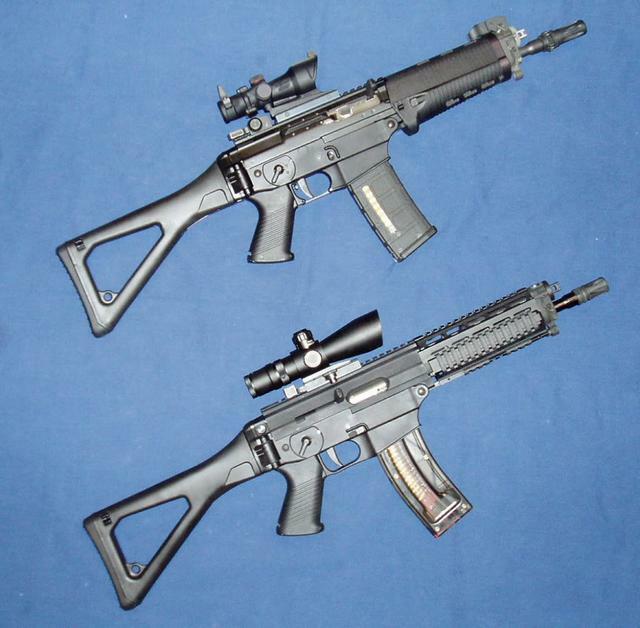 Thing is, American Tactical lists a GSG522 that "looks" a lot like the SIG 522, albeit, a WAY more complicated design.